One year ago, I stopped eating regular pasta. 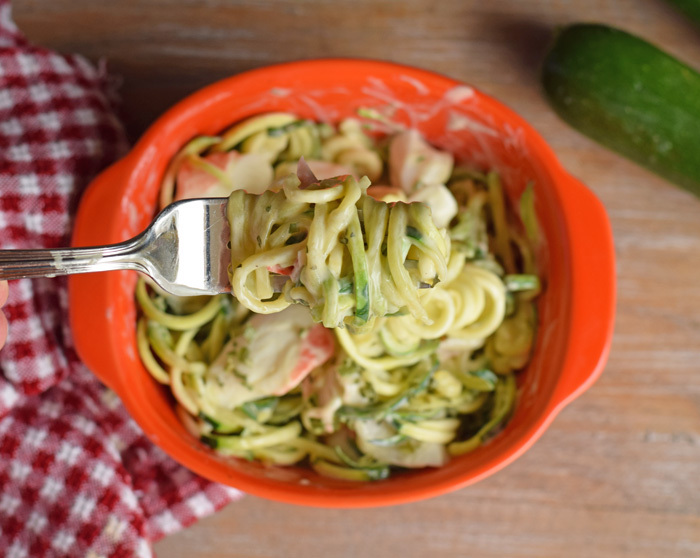 I still make the kids regular noodles (though gluten-free), and I think I’ve eaten pasta one time at a group dinner, but my preference is now zucchini noodles. They go with red pasta, alfredo sauce, pesto…..and pretty much anything else that I would have used pasta noodles for in the past. The only issue that I’ve had with zucchini noodles is that they are a pain to make. I’ve been purchasing them in the store, but the cost for that can add up quickly. When the Ninja® Intelli-Sense™ Kitchen System with Auto-Spiralizer™ went on the market, it was a kitchen hack answer for veggie noodle cooks like myself! 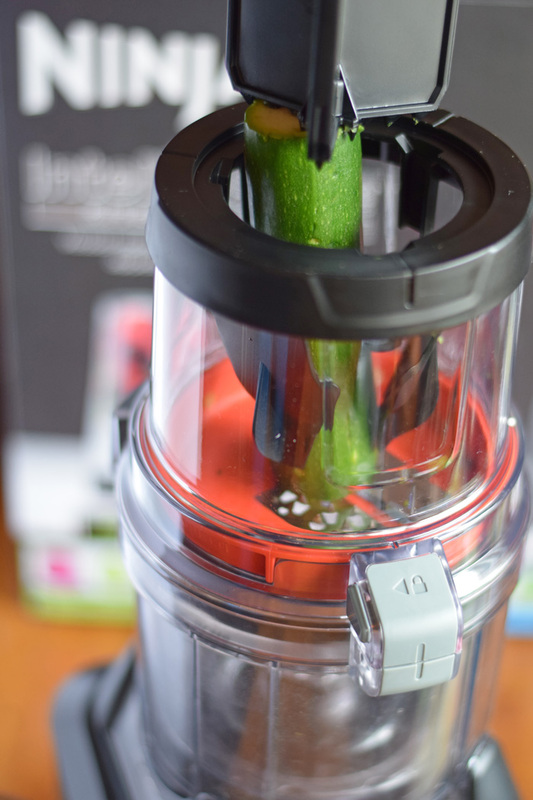 It takes the place of both the blender and food processor plus it feels the niche for those who need a spiralizer. 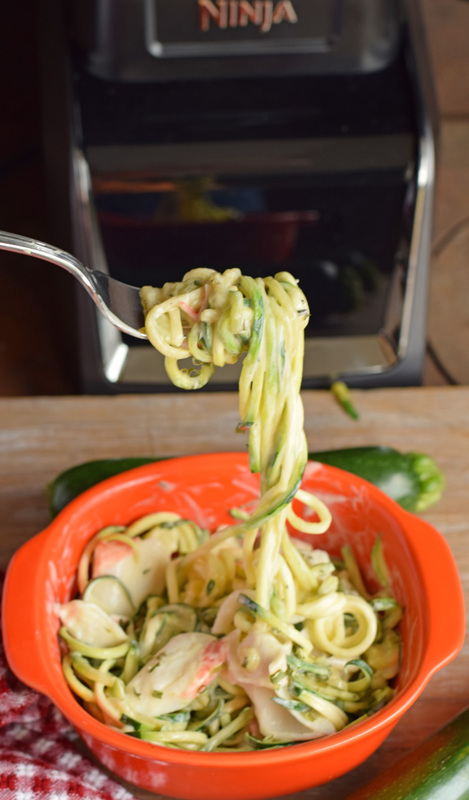 This Quick and Easy Alfredo Seafood Zucchini Noodle recipe is a tasty meal for lunch or dinner, and they are a good intro recipe for those who want to try making Zucchini Noodles for the first time with the Ninja Intelli-Sense Kitchen System with Auto-Spiralizer. 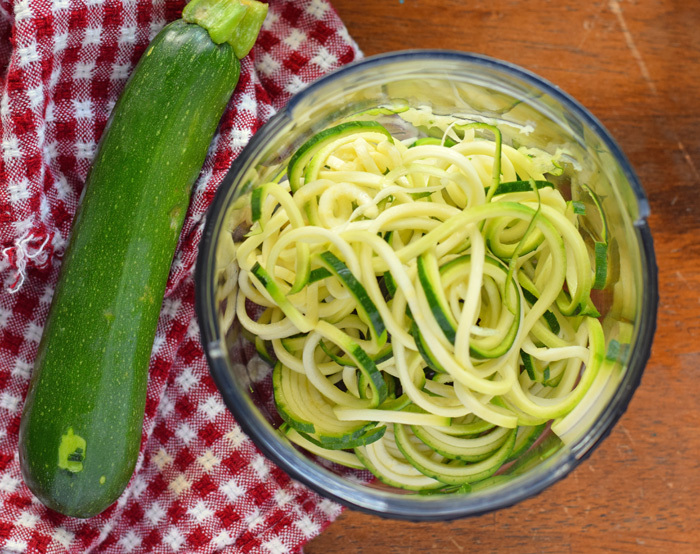 Following the easy directions for the Ninja Intelli-Sense Kitchen System with Auto-Spiralizer, spiralize the zucchini. Heat a bit of olive oil in a large skillet. Add the zucchini noodles. Add black pepper and Pink Himalayan Sea Salt to taste. Add 1/8 garlic powder OR minced garlic clove to the skillet. Cook over medium heat until the zucchini noodles are soft. Remove from skillet and plate. Heat the alfredo sauce and the seafood (if desired). I sometimes will heat the alfredo sauce and seafood in the same pot to save time and dishes. Add the seafood and alfredo to the zucchini noodles. Sprinkle with parsley. Stir to combine. 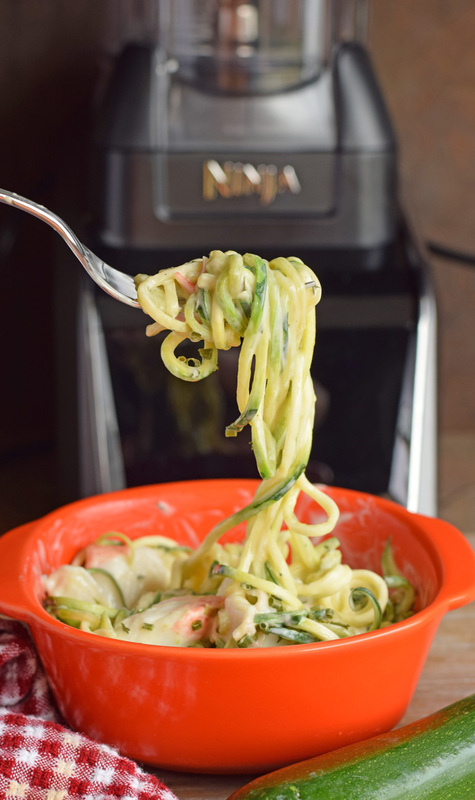 The Ninja Intelli-Sense Kitchen System with Auto-Spiralizer makes creating these zucchini noodles so easy. The one smart base transforms into four high-performance appliances: a 72 oz. Total Crushing® Blender, a 64 oz. Precision Processor™, a 24 oz. 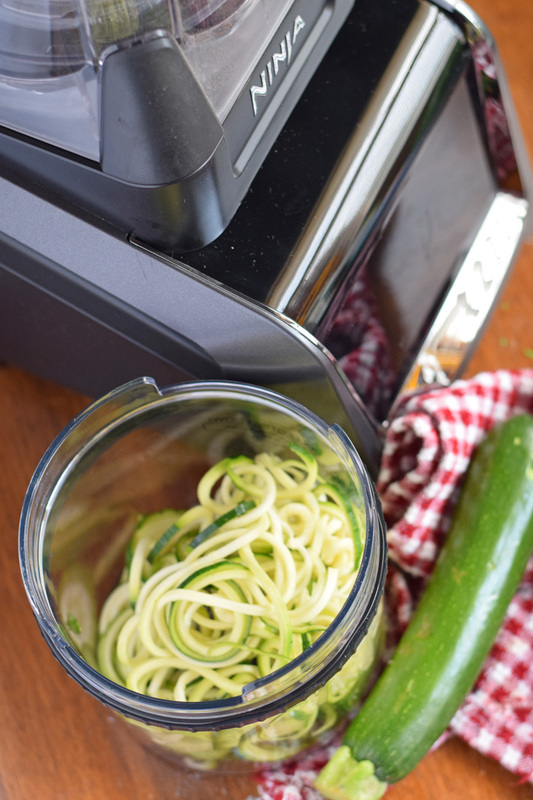 Single-Serve Cup, and an Auto-Spiralizer. The Inituitive Touchscreen is easy to use, and it allows me to select from the 12 Smart Programs with a simple tap. The Ninja Intelli-Sense Kitchen System with Auto-Spiralizer also has Smart Vessel Recognition to determine which of the vessels are attached to the base, leaving less guess work for me. This one small kitchen appliance can take the place of so many other appliances, saving kitchen space and money. 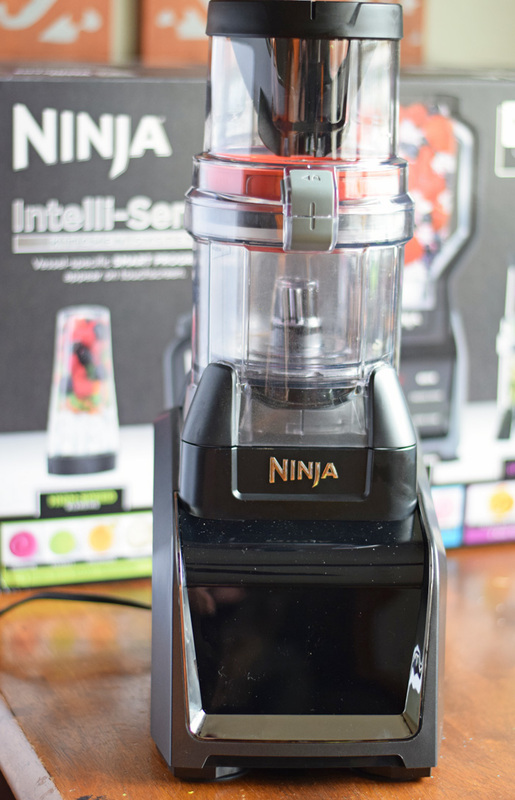 How would you use a Ninja Intelli-Sense Kitchen System with Auto Spiralizer? 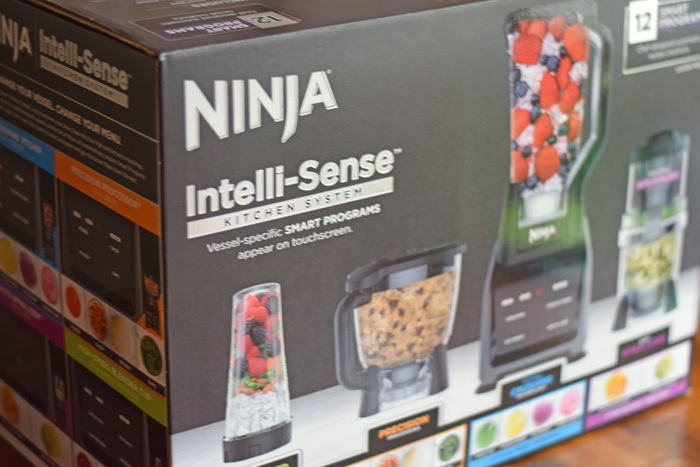 Twenty-Five (25) winners will be randomly selected and will each receive one (1) Ninja® Intelli-Sense™ Kitchen System with Auto Spiralizer™! Use the form below to enter to win until 12/31/17. Use my code MELANIE15 to receive 15% off your very own Ninja® Intelli-Sense™ Kitchen System with Auto-Spiralizer™ – good from now until Dec. 31, 2017. Winners will be randomly selected from all program entries and Ninja will facilitate fulfillment of the 25 winning prizes. It Happens in a Blink, LLC is not responsible for winner selection, notification, or prize shipment. Void where prohibited. Only valid entries accepted. This looks awesome! I can’t wait to try this recipe. I’ve been reading a lot about Ninja systems today and wasn’t aware of this one! 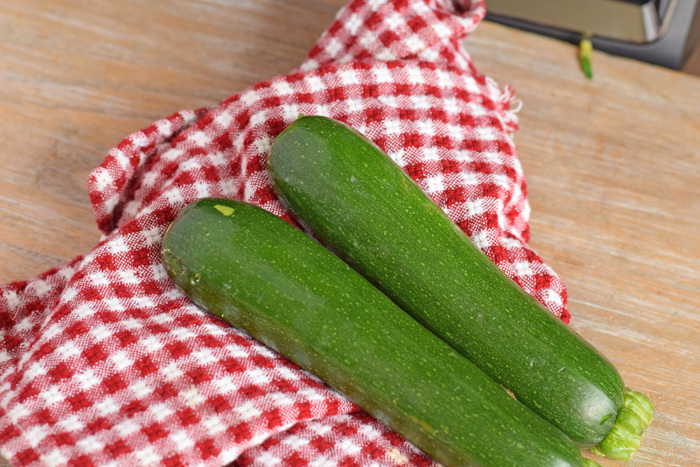 We love zucchini and I have a pretty good faux alfredo recipe for vegans. Going to enter to see if I can win…thanks for the chance! I put this on my wish list for Christmas and my birthday. My kids LOVE when i make veggies noodles so I am so excited to try this This recipe is going to be added to our meal plan too. YUM! That looks fantastic! I love Alfredo sauce, it’s so creamy and rich. I’m also a huge fan of the Ninja line of kitchen appliances. I got my mom one of their choppers a few years ago and it lasted forever. We have the Ninja Cooking System with Auto-iQ and it’s saved me SO much time. Now this is the kind of meal I’m looking for! I’ve been trying to eat healthier and this is the perfect substitute for my pasta nights. It looks amazing. Thanks for sharing! We tried several spiralizers with not much success. 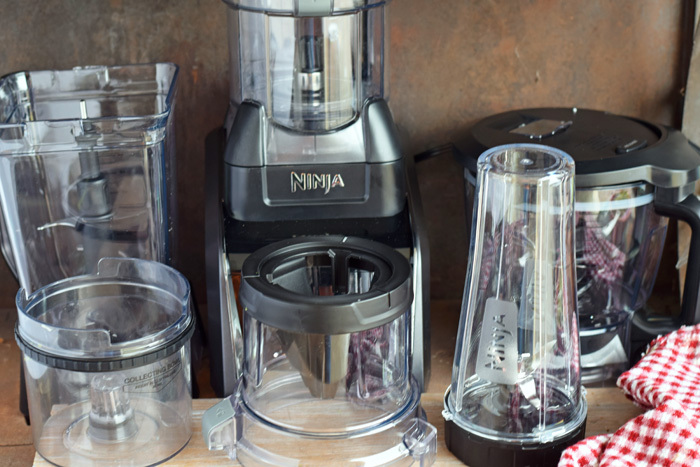 The Ninja looks like it might just do the trick.It looks like such a healthy and easy way to make some really good tasting meals. I love this! I’ve been trying to find pasta alternatives in order to cut back on the amount of grains in my diet. 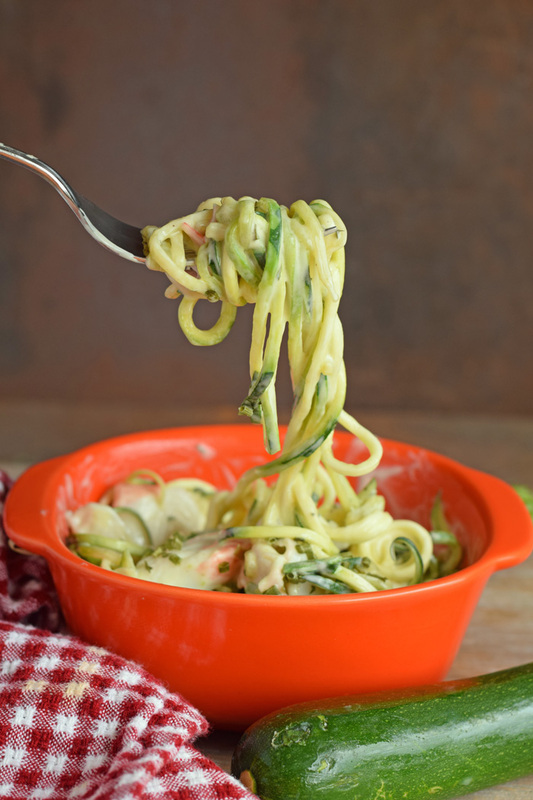 Using zucchini noodles is a great idea. Plus, this looks absolutely tasty!